The end result is a lavender that is intense and dry, but without the harshness sometimes associated with a heavy lavender top note. In Brin de Réglisse, the lavender floats along by itself for a few minutes before the licorice joins in. The licorice is faint at first, then briefly thick and chewy and dark before turning sheer again (at no time does it get overly sweet). I don't notice the orange blossom or hay until after the licorice calms, then there they are, all at once, with the hay at first dry and freshly mown, then later, deeper and sweeter, with a touch of vanilla and the merest smidgen of mild leather. Once the hay, in its turn, calms, the lavender, which I had thought long gone, comes back out of hiding, now very soft, and lingers on through the end. Lee over at Perfume Posse described Brin de Réglisse as "a series of diaphanous veils, one lifted or completely removed to reveal more fully the next transparent layer", and that is perfectly apt; it doesn't seem to follow the typical pyramid structure so much as it seems to change course entirely several times over the course of its development. The reviews I've seen so far have been less than wildly enthusiastic, but I like it very much — not so much as Vetiver Tonka or Osmanthe Yunnan, which share top honors for my favorites of the Hermessences, but still, it is really beautifully done, and I find it much more interesting and unusual than the last entry in the series, Paprika Brasil. Like Vetiver Tonka, it seems to strike the perfect balance between sweet and dry notes, and to use edible notes without quite descending into foody (although early on, I do want to eat that licorice). I'm going to need a bottle eventually. Brin de Réglisse is on the sheer side, and stays rather close to the skin after the top notes fade. The lasting power is less than impressive from my sample vial; perhaps it does better sprayed (and applied lavishly). One can always hope. I do think it will wear better in spring than in the cold weather we're having at the moment. 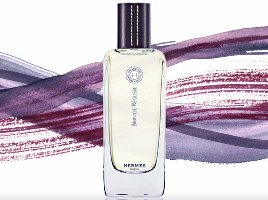 Hermès Brin de Réglisse, like the other Hermessence fragrances, is exclusive to the Hermès boutiques. It is available in 100 ml Eau de Toilette or in a set of four 15 ml sprays (the "discovery set"). The bottles are tinted lavender; the leather cap is a dark grape color. The optional leather sleeve, which can be personalized with the owner's initials, is sold separately. More Hermessences: Ambre Narguile, Rose Ikebana, Poivre Samarcande. I'm waiting impatiently for my sample of this to arrive, although I've only see that one review and didn't get the impression of it being a Big Swooner. But from your description it sounds as if the sample will be worth the wait. FBW? Really? “Big Swooner” might be putting it too strongly. I really like it, but wouldn't kill for it as I would VT or OY (which I've grown to love more and more the longer I wear it). But FBW, sort of — I don't buy 100 ml of anything any more unless I know I'm going to share it with others. But I'll certainly get 1 or more of the 15 mls. Actually, the only 100 ml Hermessence I've bought is OY, although as I've now drained 3 of the 15 ml VT, might as well have bought that in a large to begin with. Hah! Where did you finally get your sample? The SA from the Hermes here called me at the end of last week (!) to let me know they'd gotten it in, and would I call them with your credit card number so they could ship it to you…. no, really. I did not return her call. Unfortunately if I had your cc number I'd be buying something else I think there's a thing or two at the Roja Dove boutique with my name on it, and maybe I'd go ahead and let you splurge on Bolt of Lightning. I love licorice and used to eat it a lot as a child. Intriguing combination…lavender and the reglisse…I don't know if I would wear it. Maybe only on my pulses. JCE makes such wonderful fragrances and they have nice twists and turns. When trying Elixir des Merveilles I felt so sure to have smelled licorice as well at some point. So I got it at TPC, of course! Missed the last discovery set split at MUA, but next time they do one, I'm in. I think this is lovely, but at the same time, kind of a sleeper? In other words, not surprised it has not been raved about like some of the other Hermessences, but do think it is going to find fans. I love licorice in lots of scents but only rarely like lavender. This is so sheer I don't know that you'd find even the licorice overwhelming; do try it! I went from indifference to wanting to try this one. So glad you like it! It sounded like this was not going to be your sort of thing at all, so this sounds like a ringing endorsement to me! (Also thrilled to hear you are enjoying your OY more and more – it's my fave. It seemed like a bit of a sleeper, too. People seem more enthusaistic about it now than when it came out.) Of course, except for the orange blossom, BdR sounds like it has “Erin” written all over it, so I'm dying as I go into my anxious third week of waiting for my TPC sample of it (evil customs people!!) I got worried when Lee didn't really like it, and this soothes me. Of course, I don't buy 100 mls of anything any more either, but I do love those bottles. You girls are waiting for your samples to arrive.. where do you order these? In all those Dior/Luis Vuiton/etc.stores are those security guys, dressed in black, very intimidating..just standing very visibly in the stores and well, I just can't bring myself to go inside and ask the salesperson of Hermes if I could try their Hermessences..
All their products are above my budget but I could afford one or two bottles of the Hermessence line. This is really silly isn't it? Erin, will be very curious what you think. There is not a ton of OB, so don't think that part will bother you, but for some reason it just doesn't smell like I expected at all (although you're right that I also didn't think I'd like it). I think I initially thought it'd be bright and summery and sparkling, and it is much quieter than that, and while not dark exactly, darker than I thought it would be. Give it a few shots, at any rate. If it gets there — that is a long wait!!!! In NY they have the security as well, but Hermes is actually one of the friendlier of the upscale designer boutiques — I've always felt comfortable there, and the staff are generally VERY nice. And in NY, they happily give out samples of the Hermessences. Give it a try! The only place to order samples online is at The Perfumed Court, which sells decants, but don't know what their overseas shipping policy is. My experience is that overseas the sales people in stores are very friendly and very service minded. Shopping is such a nice thing to do both in the USA and Canada.. Here in CZ being customer friendly is something that goes very slowly. People are still learning that being friendly actually pays off in the end. I like your take on the lavender – it is exactly what I was thinking when I smelled it. Oh, so THIS is how wonderful lavender can smell in the hands of Mr. Ellena? It's positively vegetal to my nose which I like, but I could see how this might turn off some (who hate anything 'celery' oriented). Having said that I lovelovelove the licorice note and the middle and drydown I get (not hay) but white chocolate. Figure that? My main gripe with this, is the horrible onboxiously low longevity. I am not one to gripe and whine about longevity or for that matter to avoid a scent because it has low longevity. I am able to look past this, plus sometimes I wear 3-4 scents a day and in these cases low longevity can be a plus. But BdR is just shockingly low and it…well, it annoys me. To achieve the desired effect of 2-3 hours on me I would have to reapply atleast 3 times. At these Hermessence prices that's just OUT OF MY BUDGET. It seems like you experienced the same thing with your sample Robin. Mind you, mine is a spray, so I doubt your low longevity experience had less to do with the sample having to be dabbed one and MORE to do with the actual scent. All of you Jean Claude Ellena 'completists' out there (of which I am one) please try this. But step up to it with no expectations of it's longevity winning you over. Sounds very nice, if not spectaclular. I need to mosey on down to Hermes boutique (somehow, those phrases don't go together, but the first suits my current lazy attitude toward perfume) ,and give it a try. They have been very generous in the past. I generally do like both lavender and licorice, so I'm optimistic. This sounds really good to me, and even more so after your review. I detest licorice candy, but I do like the scent of anise/licorice. Also love the work of JCE, so this is at least a must-try (that list is getting long). Mike's comment above about longevity is worrisome, and I do find that to be a problem with several Hermés fragrances — I suppose the thing I find annoying is that I end up draining a full bottle much faster than I'd like to. Ah well. Once again, great review. Thanks. Hope you'll score a sample anyway! See, and I never drain a bottle unless I give half of it away, so I don't get quite so worried about longevity as I might otherwise, and esp. as I don't mind the investment for the 15 ml. But if I was going to use only a few fragrances, it would bother me much more. Also think I evaluate the Hermessences differently than the regular Hermes line. Kelly Caleche is cheaper (much!) but you wouldn't expect a mainstream women's scent to be fleeting, and appropriately, it isn't. The Hermessences are more like a side “art line”, and I am more forgiving on the lasting power. I guess I would just be a little more forgiving if I could get my hands on 15ml for less than $45-$50!!!! Maybe six months from now when the “new” wears off, if I'm lucky. I have such a terrible memory, but I thought they came out to more like $30-35 each?? I do know the price of the Hermessences has gone up at least once since I last bought a discovery set, so perhaps I'm quite wrong. I am so sad! I really wanted this one to work for me…but I put it on and it disappears 10 minutes later!! I just don't get it. All of the Hermessence last hours…and hours…and hours on me. Thankfully, I have the special edition George V, which smells exactly the same, but seems to have lasting power. I don't know that much about how perfume is made, so if this could be explained to me, I'd really appreciate it. Thanks! Any chance you are spraying the George V and dabbing the other from a sample? Otherwise, no clue, esp. as I don't know anything about the George V except that it exists and is reportedly similar to or the same as the Brin de Reglisse. Double spritz or tripple spritz on the same area could make a difference. That's my solution – and then 100 ml is a good quantity :-). Gor my sample today, and it surprises me. It's really lovely, especially in the drydown, but I have to dig my nose into my arm to sniff it. On the other hand, I keep getting gentle bursts of something delightful, and realising it must be the BdR…unless it's the remains of the Lalique Encre Noir on the back of my hand? I think Lee mentioned the same thing – not being sure that it was the BdR he was detecting. I suspect this is one that needs to permeate your clothing, and 'builds' the more often you wear it. Or else you could buy 100ml and simply blast away! Sigh. I really must preview my posts. I GOT my sample, rather than gor it. thanks for a lovely review, robin. like you, i am most taken with vetiver tonka and osmanthus yunnan, but i fear, after a morning of wearing BdR that i am coming to the conclusion that there is less here than meets the nose. now, i hasten to add that i am one of those who believes that we were endowed with a sense of smell not for survival or to encourage reproduction, but to enjoy the creations of jean claude ellena. bigarade concentree is sufficient proof of his undying genius, and i love un jardin sur le nil as well. both of those fragrances display one of his most engaging qualities, a kind of serious levity, as does the brillian bois farine for l'artisan. terre d'hermes is a masterpiece, surely, but walking around all day wearing a masterpiece can seem absurd; TdH strikes me as the olfactory equivalent of a pair of handmade riding boots: ravishing, bold, functional, and hard to pull off, in all senses of the phrase. so this is my complaint about J-CE in his hermes incarnation: the fragrances all display an unobjectionable but somewhat dour rectitude. one of the reasons i like paprika brasil is that it offers a brief respite from the all too discrete bourgeois charm of the hermessence series. rectitude can seem both graceful and ironic in vetiver tonka, but that's because vetiver has to be beaten into submission, and that adds a kind of drama to the scent. lavender, particularly a carefully pruned or edited lavender, promisses finesse but delivers only a chill, unwarmed by the fullness of the licorice and the softer accords on the drydown. i get it, i respect it, but don't like it. your review, on the other hand, was great. I *SO* need a second job so I can afford one or two of the Hermessence. Marianne Winia you need to get yerself to Las Vegas, there's an Hermes store (with a Birkin bag, red, ready to be purchased, no waiting) in The Bellagio there, and they let anyone mosey in and out. And the leather-clad Hermessence bottles are right up front, last time I was there. I love lavender, ok not in perfume but bath stuff. I wonder which molecular group he discarded. 100 ml is too rich for my blood, and even worn lavishly, I wouldn't use it up. I do think they need to do spray samples of this one though! Heartily applauding “we were endowed with a sense of smell not for survival or to encourage reproduction, but to enjoy the creations of jean claude ellena”, LOL! Now I don't find TdH so hard to pull off, myself, but can see your point when applied to Brin de Reglisse, and entirely agree on “serious levity” as applied to JSLN & BF. Very curious what you thought of Kelly Caleche?? I was so surprised to think only 5 distinct groups had to go…have never had any desire to make perfume, or even to become familiar with raw materials, but somehow the idea of pulling something like lavender apart and putting it back together sounds so fun, doesn't it? I admire both Ambre Narguile and Poivre Samarcande, but Brin de Reglisse bears the crown as far as I'm concerned…. LOL at “the fight was heroic” — I know that feeling! Glad to see BdR has another fan, so far, it doesn't look to be the most popular of the Hermessences. Will have to look for that Dolfin, I love several of their other bars. There is a Hermes boutique, in Luxembourg, about an hour from where I live here in Germany… oh the wonder of living in Europe! The licorice and lavender combo sounds like something my mother would love. She is a HUGE black licorice fan; its her biggest weakness of anyhting sweet or savory. She would take licorice over chocolates or wine any day… I'll have to stop in and give it a sniff the next time I roll through, which should be soon – the Christmas Market is on in city in Luxembourg, so I'll be there anyway. Is it a potential Christmas gift for dear mother? We'll see… I seem to be getting quite a few fragrances for other people's gifts this Christmas! It's worth a shot! If you haven't smelled it, you might also check out Caron Aimez Moi. Well eagerly waiting. Is this perfume availabe commonly on stores and duty free shops on the airport. No, only in Hermes boutiques — and not all the the Hermes boutiques have the Hermessences, I'm sorry to say. I need a bottle of this just for the bottle (purple being my absolute favorite color). It doesn't hurt that I really like the juice. It's dry and barely-there sweet. The licorice is dominant and yet I don't dislike it; I previously considered licorice one of the grossest edibles I've yet tasted (onions and cucumbers round out my top three xD ). It's also incredibly similar to Vetiver Tonka, to my mind. They're both dry and sweet. Wow, you know, thank you for listening to me babble. I really don't know if I could respond to so many comments and manage to keep my sanity. I like Brin de Reglisse too, but very surprised it doesn't change on you! I have to say though, that since finishing off my sample I haven't really missed it, which says to me: you don't need to spend $180 on it. You know? I understand. It's like when I tried 5 O'clock au Gingembre: it's nice, but a little underwhelming for the price and not memorable enough for me to actually commit to a bottle. Even 50ml bottles seem daunting to me now, unfortunately. As of late, I've been living almost exclusively off of samples. I think that's exactly it — they would be “exclusive” enough if you could learn about them online! Oh, you are the evil, lavender! *faints* I wondered why I did not WANTED to have a nearer look on the other scents at Hermès… because I would sleep the next month under the bridge with my bottles! I take it you’re needing a bottle of Brin de Reglisse? Ok.. I know I’m late but I have a few words to say about Brin de Reglisse:) As my nickname would tell You, I love lavender scents. My 3 favorite ones are: Encens et Lavande by SL, Lavandula by Penhaligon’s and of course, Brin de Reglisse. Lavandula is a light, airy, green, herbal lavender. Nothing less, nothing more. It might not sound too complex, but it’s actually very acurate and true to a pure, lavender scent. Ecens et Lavande… ohhhh that incense and lavender…need I say more? Well, Brin de Reglisse… is another stunner. Do You know what I like to compare Brin de Reglisse to? SL Mandarine-Mandarin!!! And MM is one of my favorite perfumes ever created. I know they sound like totally, totally different fragrances but they share the same… hmmm how do I phrase it? The share the same tone, or maybe an olfactory direction in which they both tend to go towards? Well, where Mandarine-Mandarin is hot, that’s where Brin de Reglisse stays cool. Where MM turns from a candied-orange, into an indian spice market, is exactly where Brin de Reglisse departs from it’s herbal lavender opening, into a spicy, licorice heart. Do You guys now understand where I’m coming from? I would say they are sister fragrances, just MM represents the orange-y-red on the scale, is where Brin de Reglisse stands for purple-bluish hues… oh I love them both! Interesting, would never have thought of BdR & MM together!